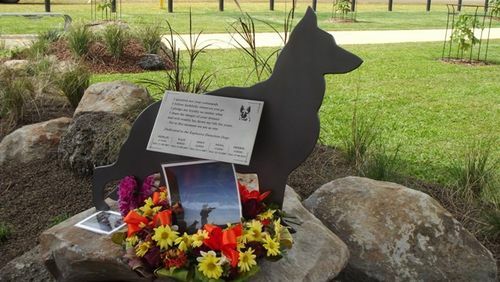 A monument commemorates the Explosive Detection Dogs, Merlin, Razz, Andy, Nova and Herbie who were killed in the line of duty between 2007 and 2010 during the Afghanistan conflict. In a corner of the Australian recreation area in Tarin Kot Afghanistan, a memorial was built following the deaths of Sapper Darren Smith and his dog, Herbie, in June 2010. Andy, a two year old kelpie cross ,a member of the Special Operations Task Group (SOTG), was accidentally killed when struck by a vehicle within the Kamp Holland complex at Tarin Kowt. Andy was laid to rest near the Kamp Holland kennel complex alongside fellow fallen Explosive Detection Dogs Merlin and Razz. Nova a bomb detecting dog died in a car crash that was part of a military operation. Medics tried to save Nova but she was put down by the regimental medical officer. Heartbroken soldiers farewelled Nova as her coffin was loaded on board an Royal Australian Air Force cargo plane for the flight back to Australia.